Spoken word, an age-old oral tradition, is literature's oldest form. When artists like Shailja Patel embrace poetry and unleash the metaphors with feeling, speed, and without inhibition - it is a zeitgeist. Please join us in celebrating the spirit of the times with a spoken word performance by Shailja Patel. She will perform pieces from her latest one woman act, Migritude. MIGRITUDE explores global themes; heritage, war, freedom, by making intimate family treasures public. Similarly, it expresses universal experiences of colonized peoples through the journeys of Shailja’s own diasporic Indian family. Three cross-continental migrations shape the story: the early 20th-century migration of Indians to East Africa; the mass expulsion and emigration of East African Indians to the global North from the 1970s onwards, and Shailja’s own emigration from Africa, to Europe, to the US. The sequence maps her personal transitions as a migrant: from survival to self-expression, invisibility to activism, model minority to radical artist. Shailja is a Kenyan Indian explosion on the national spoken word scene. She performs to standing ovations across the US and internationally. In 2004, she was invited to perform at the Lincoln Center, New York; to collaborate with jazz legend Jon Jang in the Asian American Jazz Series; and to participate in the Nautilus Institute's prestigious Scenarios Workshop, along with luminaries of the Left such as Daniel Ellsberg. 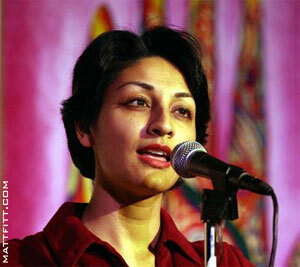 Recent highly-acclaimed appearances include keynotes at Yale and Brown Universities; London's Poetry Café, the Diverse Arts Showcase in Glasgow, Women Against War Northern California Tour; the San Francisco Dyke March, the Radical Performance Fest (a Bay Area Critics Choice Selection), and the groundbreaking Yoni Ki Baat. Shailja shared the stage with Holly Near, Michael Franti, and Ram Dass at Our Grief Is Not A Cry For War, the 9/11 anniversary concert at San Francisco's Justin Hermann Plaza; and performed for crowds of over 50,000 at Not In Our Name Rallies. Her words, aired on the National Radio Project and Pacifica Radio, have generated responses from activists and academics worldwide. Shailja's work appears in numerous journals and anthologies, and the CD, Best of the Berkeley Slam Poets. Introduction by:Junichi Semitsu, Lecturer, Department of African American Studies, UC Berkeley & Director, Poetry 4 the People. Sponsored by Asia Society. Co-Sponsored by EKTA; Asian Improv Arts; Locus Arts; Kearny Street Workshop; Poetry 4 the People; and BART (in celebration of Asian Pacific American Heritage). For further information contact the Asia Society at 415-421-8707.